Small businesses are rapidly moving to mobile solutions to gain anytime, anywhere access to people, information and applications. As mobile becomes a mainstream solution technology, small businesses must also factor mobile into their broader technology strategies and plans. 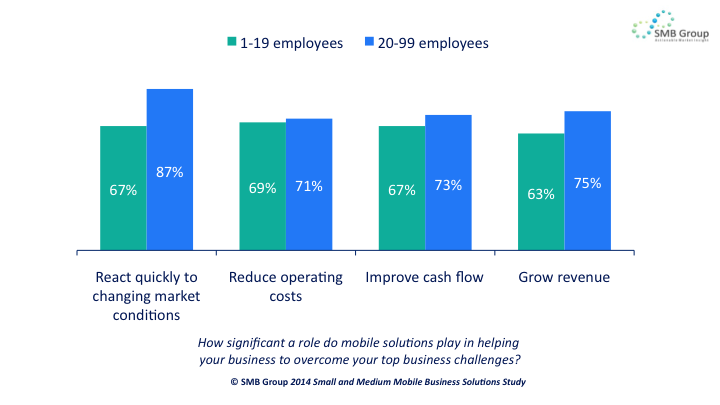 Our 2014 SMB Mobile Solutions Study highlights the powerful impact of mobile in very small (1-19 employees) and small (20-99 employees) businesses to date, and implications for the future. Mobile applications are quickly becoming indispensable for many small businesses. As shown on Figure 1, a half of very small and two-thirds of small businesses regard mobile solutions as critical for their businesses. Slightly more than half of these organizations also view mobile apps as helping to drive business growth. Consequently, it’s not surprising that mobile apps are playing a bigger role in small business operations. A substantial majority see mobile apps as complementing traditional business apps, and 67% of very small and 73% of small businesses believe that mobile apps will even replace some of their current business applications. For small businesses, cash is king. 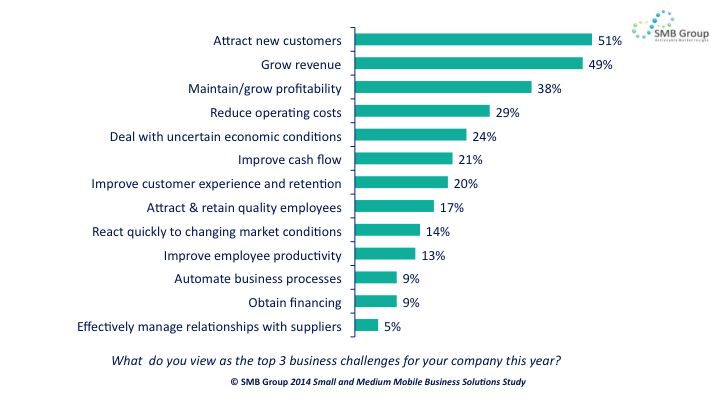 Attracting new customers, growing revenues, and maintaining/improving profitability as top business goals (Figure 2). Small businesses see mobile solutions as very instrumental in helping them to address these and other important customer engagement, workforce and financial goals. 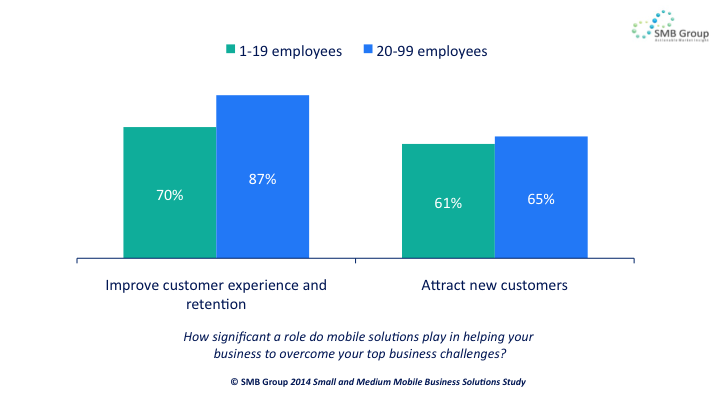 For instance, 70% of very small and 87% of small businesses agree that mobile solutions play a significant role in improving customer experience and retention (Figure 3). Almost two-thirds see mobile as playing a significant role in helping them to attract new customers. 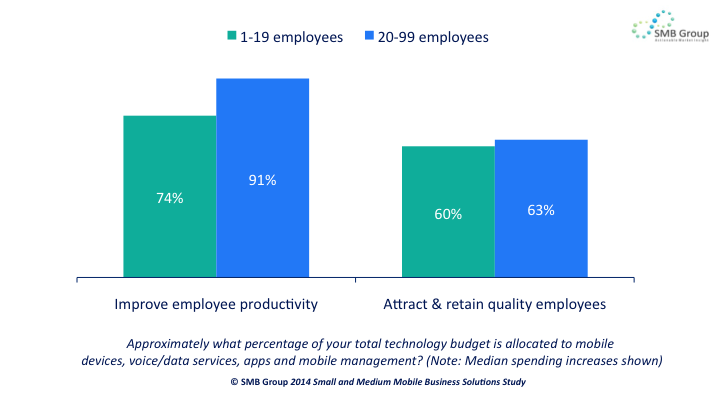 Survey respondents are also convinced that mobile solutions help them create a more effective, productive workforce environment, with 74% of very small and a close to unanimous 91% of small businesses seeing mobile as boosting employee productivity. Furthermore, almost two-thirds see mobile solutions as helping them to attract and retain quality employees, reflecting the reality that people increasingly want to gain the same level of mobile access, convenience and information in their business lives as they are getting as consumers. Mobile solutions are likely to become even more important to recruiting new employees as small businesses seeking to hire more younger workers and millenials. Perhaps most telling, small businesses see mobile solutions as playing a significant role in helping them meet critical top and bottom line business challenges, such as reacting quickly to changing market conditions, reducing operating costs, improving cash flow, and growing revenue. 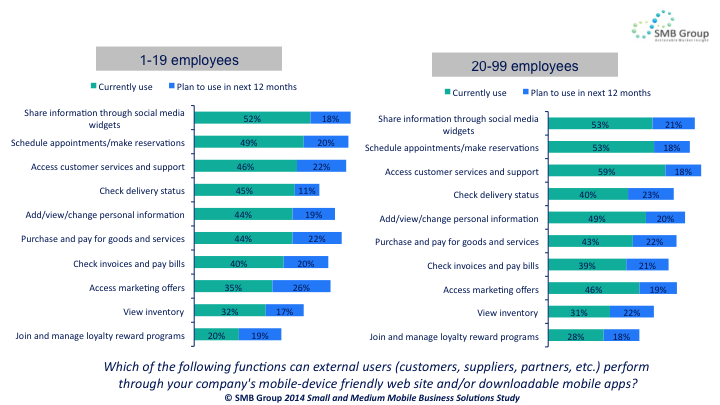 Businesses are taking advantage of providing employees with the ability to work anytime, anywhere via mobile devices (Figure 6). Small business use of basic collaboration and productivity tools such as email, calendar and contacts is already mainstream, with upwards of 80% of very small and small businesses already using these apps on mobile devices. 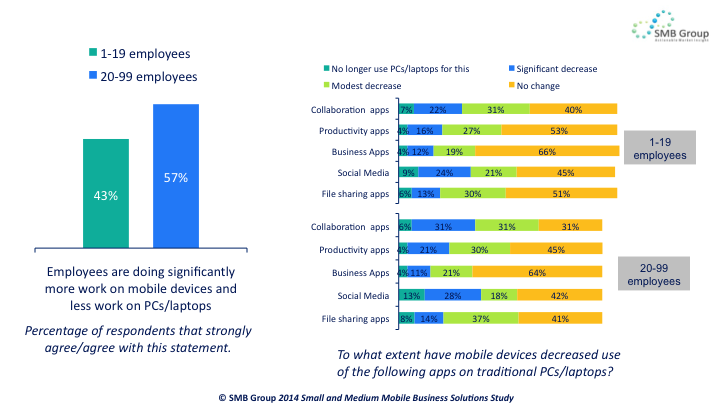 However, some mobile collaboration and productivity apps are poised for strong gains next year, with 20%-plus of small business respondents planning to deploy mobile conferencing, document management, find-me-follow-me presence, personal assistant and/or document editing and creation apps within the next 12 months. 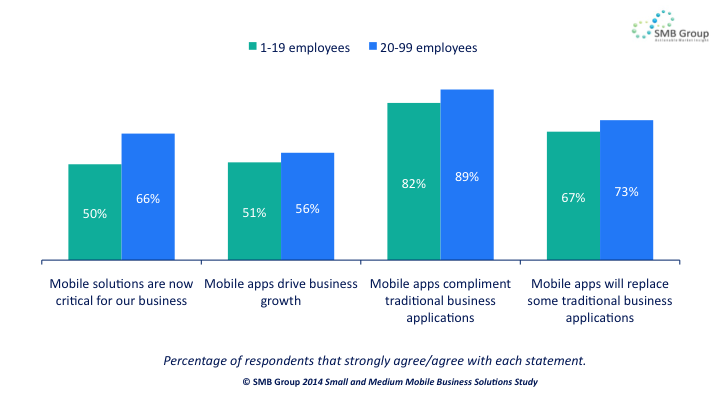 Mobile business apps have made strong gains over the past three years, particularly among businesses with 20-99 employees, where the number of mobile business apps used regularly jumped 27% over the past year. We expect this trend to continue, as respondent’s plans to add new mobile business apps in the next 12 months were strong across the board. Mobile apps for time management and capture lead the way, with 25% of both very small and small businesses planning to add this capability; followed by mobile marketing and advertising (24%); business analytics (23%); and financial management/payment processing (23%). Since attracting new customers and growing revenues are top goals for small businesses, it’s not surprising that they are investing in mobile web sites and apps for customers, partners and suppliers. 48% of small businesses now have a mobile-friendly website, and 30% offer at least one mobile app for customers. Growth across all functional areas is up dramatically year-over-year (Figure 7), and plans to add more external-facing apps are healthy. Small business attitudes about mobile solutions are remarkably positive, and small business ascent up the mobile adoption curve has been nothing short of revolutionary when compared to other technology areas. 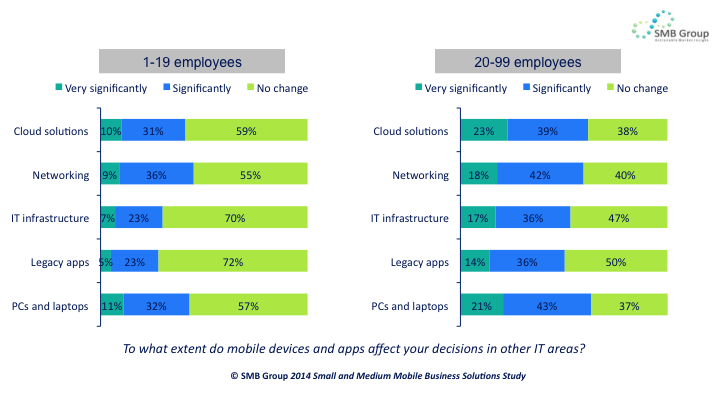 As a result, mobile is already having a significant impact on decision-making in other IT areas (Figure 8). As the mobile-first mentality becomes more pervasive, small businesses will need more guidance to ensure that their strategies for cloud, networking, infrastructure, legacy applications and devices support, enhance and integrate with the mobile solutions they deploy. By developing a holistic strategy, rather than taking a reactive approach, small businesses can both maximize value from their mobile investments, and reduce management headaches down the road. This is the second post in a two-part series sponsored by Dell that discusses how small businesses are using mobile technologies in their businesses.